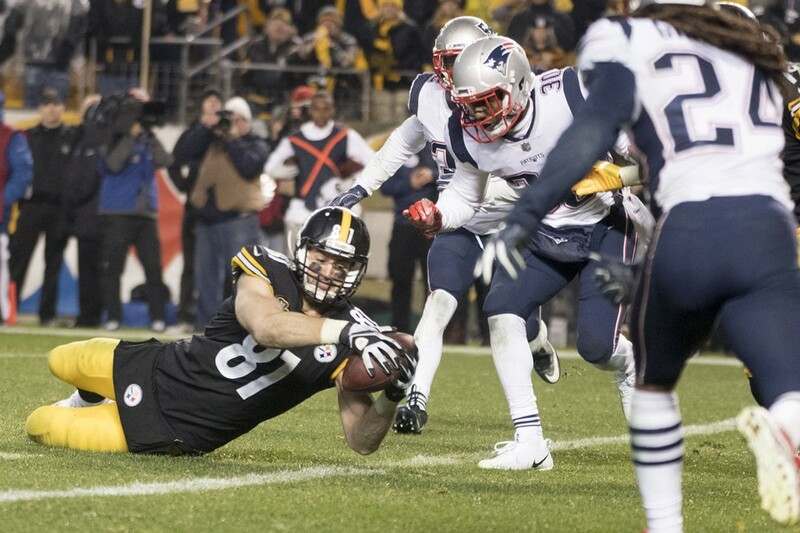 On other words Jesse James touchdown catch against the New England Patriots would now, in fact be a touchdown catch. Remember, the Steelers were on the ropes. The Patriots had just taken the lead and the Steelers got the ball back with 52 seconds left and one time out. Ben Roethlisberger hit JuJu Smith-Schuster for what had to have been the most electrifying 69 yard pass in Pittsburgh Steelers history. Then Ben Roethlisberger hit Jesse James to seemingly put the Steelers ahead with 34 seconds remaining. …Several minutes of dead air space, while some guy in a suit sat there in New York, reviewing the play frame-by-frame, back and forth, from 15 different angles and ultimately reversedthe call. Instead of most valuable player being someone who did something on the field, NFL officiating czar Alberto Riveron had the most influence on the game’s outcome. Get over the Jesse James Catch/non-catch and move on. That’s right you heard it. Get over it and move on. Did the Steelers get screwed? Yep, they did, especially when you consider that the NFL secretly modified the rule going into the Super Bowl. Is the play indicative of much of what ails football? Yes, as discussed above. But you know what? The impact of this call has grown exponentially since that December evening. To listen to some Steelers Nation citizens, it is almost as if the Immaculate Reception had been nullified. It pains me to say this, but Steelers fans whining about the play is almost reaching the level of Seattle Seahawks Super Bowl XL excuse making. The Steelers loss to the Patriots cost them the first seed in the AFC playoffs, which brought the Jacksonville Jaguars to Pittsburgh in the AFC Divisional Playoffs. And we shant say who won that one. But some in Steelers Nation seem to hold Alberto Riveron responsible for that shellacking. He’s not. Let’s look at why. Go back to the Patriots game itself and review what the Steelers could have done in the 28 seconds after the touchdown reversal. Pittsburgh could have kicked field goal to tie the game. They chose not to. Darrius Heyward-Bey could have dropped the pass to stop the clock. He did not. The Steelers could have clocked the ball and called their final play on their terms. They did not. Ben Roethlisberger could have tried to do something other than force the ball to Eli Rogers in triple coverage. He did not. OK, the referees could have penalized the Patriots for blatant pass interference on Eli Rogers. They did not. NFL football teams do not get to choose when they suffer bad calls, only they get to choose on how they react afterwards. Perhaps the ensuing chaos was a straw that broke the camel’s back in Ben Roethlisberger’s fractured relationship with Todd Haley. Maybe the cause lie elsewhere. It matters not. The Steelers weren’t ready. But let’s imagine that the Steelers had had scored. Are you so sure that Pittsburgh’s defense would have stopped Tom Brady to Rob Gronkowski, the same combo at annihilated the Steelers in the 4th quarter? I’m not. But let’s say the Steelers defense holds. Can Steelers Nation jump to the conclusion that today Lombardi Number 7 is getting polished on the South Side? In a playoff game at Heinz Field, with a healthy Ben Roethlisberger, Le’Veon Bell and Antonio Brown, the Pittsburgh Steelers would have a fair shot at beating the New England Patriots. But which outcome are you more certain of? A decisive Steelers win, or a game that goes down to the wire? My money’s on the game doing down to the wire. Let’s say Pittsburgh beats the Patriots in the playoffs. Would the Steelers have prevailed against the Eagles in Super Bowl LII? It is possible. But if the Ryan Shazierless Steelers defense was powerless to stop Leonard Fournette, is there any reason to think that they stopped LeGarrette Blount and Jay Ajayi? And while we’re at it, let’s remember that this same Philadelphia defense humiliated the the Steelers offense to 3 points the last time the two teams faced. The Steelers got wronged by the NFL on that fateful December day. But the truth is that the Ryan Shazier’s spinal contusion dealt a far graver blow to Steelers 2017 Super Bowl chances the Jesse James non-catch, non-touchdown replay reversal. Steelers fans need to accept that and move on. This entry was posted in Steelers 2017 season, Steelers 2018 Off Season and tagged Antonio Brown, Ben Roethlisberger, Darrius Heyward-Bey, Eli Rogers, Jesse James, JuJu Smith-Schuster, Le'Veon Bell, Pittsburgh Steelers, Steelers vs. Patriots, Todd Haley. Bookmark the permalink.